In 1993, the city of Houston purchased the former Quillian Memorial Center from the First United Methodist Church of Houston at a cost of $3.5 million and added it to the city’s park inventory. Originally called Southwest Park and later Quillian Park, the site was officially renamed Alief Community Park in July 1997 at the request of former Council Member Ray Driscoll to reflect its community. 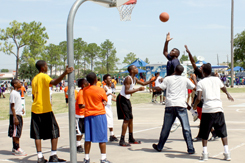 The park acquisition was designed to meet the recreation and leisure needs of southwest Houston. In 1997, under the Parks to Standard Program, a program initiated by former Mayor Bob Lanier to bring 277 parks up to standard, this newly acquired park received more that $857,000 in improvements which included community center renovations, parking lot improvements, fencing, refurbished restrooms and drainage ditch re-grading. 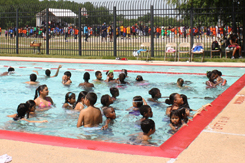 Alief Community Park received more than $2.5 million in park renovations in 2004 which included improvements to the tennis courts, plaza, courtyard, playground and walkways. The community center also received classroom renovations, new lighting and general restrooms and building improvements. On June 25, 2011, a groundbreaking ceremony took place for a new hike and bike trail in Alief Community Park. It was funded through a Texas Department of Transportation grant secured by Congressman Al Green. Sitting on a 37.3-acre tract of land, the park is home to the Alief Park Community Center, swimming pool, wading pool, bath-house with locker room, four lighted tennis courts, two lighted baseball fields, four sets of bleachers, a soccer field, multi-use pavilion, picnic area, two playgrounds and a lighted paved parking lot. City of Houston parks are provided to the public for their use and enjoyment. The user in turn shall have the duty and responsibility to protect and conserve the plants, animals, facilities and tranquility of the park. Alief Park would be a great place to host special gatherings such as family reunions and birthday parties for a nominal rental fee. Deposits are required and are refundable. Contact the Permits Office at 713.865.4527 to reserve your spot.